A non-indoctrinated individual living apart from the church/community. Christian: adj.1. of Christ’s teaching or religion. 2. Believing in or following the religion of Jesus Christ. 3. Showing the qualities associated with Christ’s teaching. 4. Colloq. (of a person) kind, fair, decent. n. 1a. a person who has received Christian baptism. b. an adherent of Christ’s teaching. 2. A person exhibiting Christian qualities. Rogue Christian: Rogue = adjective, Christian = noun"An non-indoctrinated adherent of Christ’s teaching, driven away or living apart from the church/community." Living apart from traditional church has it's implications and complications. In addition to being a Rogue Christian it also makes me an Abbaian, a follower of the Father. -ian: suffix var. of –an. Forming adjectives and nouns, esp. from names of places, systems, zoological classes or orders, and founders.Abba + ian = Abbaian: Follower of the Way of God the Father. As far as church membership goes, I am not a member of any local visible church or denomination (which is not to say I am not active within any local church or churches). Denominational background really doesn't apply. I consider myself a member of the Invisible Universal Church, which transcends denominations. I belong to a Postdenominational Christianity. However, another implication is an apparent lack of doctrine. What's my views on soterology? Am I a Trinitarian ? Am I an Evangelical? I am often asked, Calvinist or Armenian? Are those the only options? I find the question somewhat limiting. To be honest I agree with both and neither. I think - from a very simplified perspective - Calvinism and Armenianism are the same thing, but from two very different perspectives. If a man's life - from birth to death - were a movie, we would perceive it as an audience watches a movie. we're experiencing it as the movie "plays" or "flows" forward. However, from a divine point of view - from God's perspective - the movie reel is unrolled and the entire film, every static frame, is viewed at once. "Time" doesn't flow. For the occupants "in" the movie, choices and free will exists. From an omnipotent perspective, God can view the beginning, any and every choice made via free will, and the end and it's consequences, at once. Even though free will choices were legitimately made, God still knows their outcome. I have a problem with predestination and God's chosen elite. It's the inverse implication that bothers me: We have a loving God who has also created people for damnation and without hope. Some have told me I'm more Armenian because I do believe you can shipwreck your faith and lose your salvation. I don't think I really am Armenian though. You see, both Calvinism and Armenianism share their defaulted starting positions. In both, man is born in original sin, fallen and condemned. At some future point, salvation occurs. They differ on the point of whether that salvation is permanent or not. Although I believe you can lose your salvation, I'm not convinced we begin in a default state of being "fallen" anymore and I'm not convinced we "accept" salvation but rather (potentially) choose to opt-out of it. I've been told my "soterology" is closer to a hybred of Catholicism and Universalism. It all have to do with my understanding of the nature of Grace. For further postings see The Woven. Paul so often talks about Grace over the Law. There is an odd and strange tension between the two. But what concerns me are two things: Firstly, either extreme manifests serious and dangerous issues. Jesus repeatedly and unrelentlessly attacked Legalism because of it's indifference and hard heartedness. But the other end of the spectrum, is a chaotic free for all! The belief that Christ's atonement has been complete and absolute, to the critical point where we no longer carry any accountability. The belief that we have been given free licence to do whatever we want with no consequences. After all, God will forgive us, right? This is Licentious. My second concern is its effect on dialogue; on how Christians communicate (or miscommunicate) and suffer severe misunderstanding over this issue. 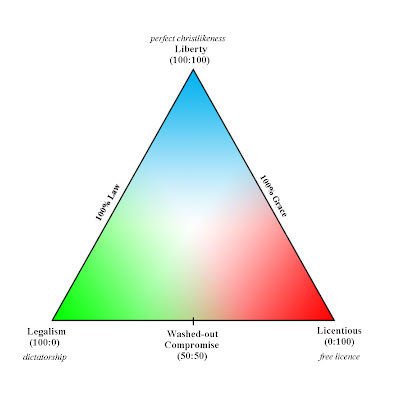 We have a dichotomous scale with Legalism at one extreme end and Licentiousness at the other. Both will warn the other of its potential danger, and rightfully so! Fundamentalism is a move, a shift towards the dangers of Legalism, while the "Emergent Movement" runs the risk of entering into the Licentious. But to point out flaws and errors while not offering any sort of solution or goal is not complaining, but bickering at best, or bitching at worst. Bitching and bickering are not only counterproductive, but also divisive. But what is the answer? If we are not to be legalists and we are not to be licentious, what are we supposed to be? I am not content with the cookie-cutter answer of, "we are to try to be like Jesus". Although the answer is true, it is lame, a cop-out, and poorly thought out at best. Was Jesus a legalist? Absolutely not! Was Jesus given to free licence? No. So are we to believe that Jesus maintained a perfect balance between the two; the exact epicenter; the balance point of this scale? Many would say, yes, but I would completely disagree. From what I have seen, this "balancing point" is a sellout and a watering down of all truth. Jesus does not represent 50% Grace + 50% Law. Jesus is 100% Grace and 100% Law. This position does not exist on this dichotomous scale. I've come to the conclusion that this scale is only useful in determining where we begin our journey, but cannot be used to map our journey itself. To move in any direction on this one-dimensional dichotomy represents absolutely no spiritual growth. This paradigm - especially within ecumenical discussions - must be laid to rest. There is a third option, a third direction in which we all need to focus on and move in. Legalism: Exaltation of law or formula, red tape. Preference of the Law to the gospel, doctrine of justification by works. Licentious: Lascivious, lewd. Disregarding accepted rules or conventions. Liberty: Being free from captivity, imprisonment, slavery, or despotic control. We are free to break the Law, but only for the right reasons. What we really need to be aware of is that this message, this gospel, this good news, this Jesus, is an extremely dangerous one. One that is a threat to nearly every kind of establishment and institutionalism that we know of. Are we ready to explore what this new avenue means? Are we prepared to follow his lead? I don't see this as a perspective or a certain point of view. I would hope this is something we could all collectively agree upon. Namely, that our spiritual maturity, our growth must not be in any sort of horizontal direction on this diagram, but only vertically, only "up"; only towards christlikeness. It is the clearest it has ever been made to me personally. It seems clear to me this is the core of Christianity, framed in the context of "love thy neighbour". If I had to trim Christianity down to it's core essentials, I think this would summon it up perfectly in its profoundest simplicity. This is a christianity I can wholeheartedly embrace. This is a kind of christianity that I could cease being a Rogue in; that I could cease "living apart from the herd". If this truly isn't the core of christianity; of God's will, then I'm not sure I want anything to do with it. Please allow me to give credit when credit's due. The core idea behind this post was from a friend of mine - a baptism youth minister - on his last and final sermon. You can listen to it here. Freedom ... free from or free to? I have fallen in love with Irshad Manji's concept of ijtihad. The third source, or root, of Islamic law is called ijtihad (“responsible individual opinion”). It has been used when an issue was not covered by passage in the Qu'ran; a jurist may then resolve the issue by using analogical reasoning. Such reasoning was first employed when Islamic theologians and jurist in conquered countries were confronted with the need to integrate local customs and laws with the Qu'ran. It led to the Golden Age of Islam. The Muslim principle of ijtihad (independent judgment) should encourage and be receptive to new ideas. The Qu'ran itself demanded constant revision and self-examination. (Although it is obvious that much of Islam today has lost or abandoned this). Knowledge was not simply a matter of acquiring information but a process of transformation. There was emphases on the unity of truth, which must be sought everywhere. A seeker after truth must shun no science, scorn no book, nor cling fanatically to a single creed. However, this form of ijtihad existed in the Golden Age of Islam and has unfortunately been abandoned by most Muslims, resorting to indoctrination over education, blind-faith over thoughtfulness. How many Christians do I know that do indeed shun science, read only certain books, and definitely cling fanatically to their creeds? It is a shame that much of Christianity frowns upon analytical thinking, most often times resorting to accusations of putting one's thoughts or authority above God's and quoting Proverbs 14:12 (“There is a way that seems right to a man, but in the end it leads to death” - I know that one was thrown at me more than once). But yet in 1 Thessalonians 5:21 says, “Test everything. Hold on to the good.” Sounds a lot like placing emphases on truth, which must be sought everywhere. A seeker after truth must shun no science, scorn no book, nor cling fanatically to a single creed. It would seem that most Christians suffer from this closemindedness. I think there is a good lesson and a great richness to take from ijtihad. Ijtihad is something I'd like to learn more of and incorporate into my "theology" - into my life. In fact, to some degree, I already have. The Enlightenment of the 17th century said that Reason and Faith; Science and Religion were incompatible. And like puppets, people accepted this statement as truth and chose which side they were going to defend: Reason and Science, or Faith and Religion. Secular-Atheism and Fundamentalism were born from this forced erroneous dichotomy. Christian Fundamentalism was one byproduct of The Enlightenment. I believe the Evangelical is a child of Christian Fundamentalism. Who are these “Enlightened”? Granted, there are two schools of thought (at least), but both are children of The Enlightenment. These two children are both The Darkly-Enlightened and it has become obvious (to me at least) that both are mistaken. Both schools of thought/belief (Secular-Atheism and Christian Fundamentalism) have been “enlightened” darkly. It is a great line and absolutely true, in spite of the fact that the movie is a work of fiction. If we are going to go by this odd standard, than anything Jesus quotes, says as a parable, or refers to must be a literal-factual-historical truth. If this is the case, then there are some pretty big issues that must be re-addressed, because Jesus also quotes from books of the Apocrypha. The Darkly-Enlightened are not going to dictate the criteria or boundaries of the truth to me. I do not accept their dichotomy of Secular-Atheism (Naturalism) or Christian Fundamentalism. I openly reject The Enlightenment’s (modernity’s) either/or-paradigm. I do not accept that Reason and Faith, & Science and Religion are incompatible! I embrace the both/and-paradigm. Not only do I believe that Reason and Faith are indeed compatible, I believe they are necessary; the absence of one weakens and cripples the other. It is interesting that some denominations lack mysticism. We all have natural facilities, innate abilities, or learned methods to help us seek, explore, and "experience" God. These are "methods" of man reaching out to God. All of the above listed 4 “methods” are man searching or reaching out to God. There is a 5th, but it isn’t really a method and relies on absolutely none of our natural facilities. We cannot practice this 5th method nor do anything to improve it. But I’ll list it only to make this more complete. The 5th “method” is Revelation (through the “facility” of prophecy), but this isn’t man searching or reaching out to God. This is God reaching out to man. The Darkly-Enlightened have crippled or outright killed the Empirical, the Philosophical, and the Mystical methods. If Reason and Science cannot be compatible with Faith and Religion, then little is left but the Academic and the Mystical. But if our facility of imagination is made synonymous with pretending, then the mystical experience is also lost. One of The Darkly-Enlightened brothers (Christian Fundamentalism) has embraced the Academic only, which I believe is manifested within most of Protestantism by Sola Scriptura (Scripture only). The other Darkly-Enlightened brother (Secular-Atheism) has laid claim to the Empirical only, which is manifested within modernity’s Naturalism. And both of these dark brothers make their warfare at the expense of all other methods, in essence blinding us and blocking our paths to God. Catholicism is rich in the mystical. It is the reason why I’m looking more and more seriously into it. It is also right to assume that Orthodoxy is also rich with symbolism and powerful icons. These are not idols and for those who ‘write them off’ as idolatry and ignore them as such, a rich source of powerful spiritual ‘connectiveness’ is lost – deliberately abandoned. When this Mysticism is used at the abandonment of other methods, it crosses the line between Imagination into pretending or the “make believe”. The Pentecostal’s regular and necessary use of Speaking in Tongues, I feel, is a perfect example of this. Tongues used regularly and by necessity are pretending and make believe. When the Empirical is used at the abandonment of other methods, you get results like Young Earth Creationism (at the expense of established science), or, the other side of the coin, a sort of Richard Dawkinian-Evolutionism (atheism)(and you’ll notice I didn’t say Darwinian). When the Philosophic is used at the abandonment of the other methods you get results like the Greek Stoics. God has become abstract and disconnected. God becomes some supernatural entity “out there”, detached and indifferent - a Clockmaker God. There is no “presence” within our world, our lives, nature, our services, churches, or masses. God has become an abstract. "An assumption is something that we take for granted from the outset, usually quite unconsciously. As long as an assumption is a valid one, all is fine and well; but a false assumption inevitably leads to false conclusions. One would hope that even when one has made an unconscious assumption that when his conclusions are proven faulty he would then ask himself where his underlying error lay. Protestants who are willing to honestly assess the current state of the Protestant world, must ask themselves why, if Protestantism and its foundational teaching of Sola Scriptura are of God, has it resulted in over twenty-thousand differing groups that cant agree on basic aspects of what the Bible says, or what it even means to be a Christian? Why (if the Bible is sufficient apart from Holy Tradition) can a Baptist, a Jehovah’s Witness, a Charismatic, and a Methodist all claim to believe what the Bible says and yet no two of them agree what it is that the Bible says? Obviously, here is a situation in which Protestants have found themselves that is wrong by any stretch or measure. Unfortunately, most Protestants are willing to blame this sad state of affairs on almost anything — anything except the root problem. The idea of Sola Scriptura is so foundational to Protestantism that to them it is tantamount to denying God to question it, but as our Lord said, "every good tree bringeth forth good fruit; but a bad tree bringeth forth evil fruit" (Matthew 7:17). If we judge Sola Scriptura by its fruit then we are left with no other conclusion than that this tree needs to be "hewn down, and cast into the fire" (Matthew 7:19)." If allowed to run to its natural conclusion you end up with a belief-system that puts the bible in its center and not God. This is biblio-idolatry. In short, not only do we have a great deal to gain and learn from one another, only collectively do we have the keys to God. Only through unity do we have any hope to combat the devestating effects of the Darkly-Enlightened Brothers. That is why fundamentalist regimes like the Taliban and Hezbollah oppose change of any sort and discourage learning and education. Keep the masses ignorant and you maintain control. If you can maintain control, you can prohibit change. When these fundamentalist regimes begin to lose that control is when their ability to remain civil is also lost and any course of action they choose can be justified, including acts of terrorism, sabotage, personal attacks, intimidation, and/or bullying. The moment we come to believe we have all the answers is the moment we have crippled our ability to learn and grow, if not outright kill it. The moment we believe “we’ve arrived!” is the moment we’ve failed our journey. The Religion of the Institutional Church has attempted to make itself synonymous with the authority of God. The Religion of ‘Churchianity’ has earned people’s mistrust. This mistrust has erroneously carried over onto God, and Faith has been crippled in many people. The distinction between ‘Faith in God’ and ‘Faith in Church’ has been lost and needs to be reclaimed. The Religion of ‘Churchianity’ responds to people’s apparent lack of Faith by withdrawal into Fundamentalism. “We are the select few who hold the Truth” becomes their gnostic mantra. They retreat into an extreme state of social isolation. The only question that awaits an answer is how will this extremism manifest itself, through terrorism or extinction? And don’t fool yourselves, The Religion of ‘Churchianity’ has already attempted “terrorism” by it's bullying and intimidation through it's ‘Fire and Brimstone' Sermons. I think the final stage the Christian denomination of ‘Churchianity’ has left to enter is Extinction. Once it becomes extinct people may once again reclaim their Faith in God because that barrier has been removed. Now please allow me to make it clear what I am, and am not, saying; I am not talking about the death and extinction of the Christian Faith. I am talking about the death and extinction of that aspect, that ‘denomination’ called ‘Churchianity’; the end of the Institutionalized Church. I am not expressing my hopes or desires, but I am expressing what I foresee on the horizon. We know that God in immutable – He doesn’t change. I think often times we turn this into meaning, God is stationary and doesn’t “move”. Now there are many lost people out there in the world today. All they need is to search, or seek out God – all they need to do is find God! After all, you’ve heard the expression, “There’s a God-shaped hole in all our hearts”. This means they don’t currently have God and therefore God must be somewhere else, and since God is immutable (doesn’t “move”) then they need to move and search and find God – wherever it is that He is. Now there are also agents of God active in this world: God’s ambassadors. (Here enters the Innerrantist): They know where God “is” and can tell you how to “find” Him. They know and have experienced “the way” or “the path” to follow. They can lead you to God because they have the absolute and unquestionable “rulebook” in their possession. They have “The Truth”. “The Truth” (or “the way”) turns out to be a series of checkpoints, or criteria, to convince yourself and them that you’ve “made it”. A public confession of your faith, the Sinner’s Prayer, baptism classes, baptism by water, membership classes, church membership, finding your “spot” in their congregational life, etc. I have a problem with this when it is taught or implied to be the only way. The Innerrantist’s trick is making a slight switch or change and redefining a term. This example begins with God’s immutability (He doesn’t change), and switching it to mean being stationary and not “moving”... to not meeting us wherever we are... to meaning we have to go to where God really is (the Innerrantist’s “location”)... to having to believe and become just LIKE the Innerrantist... to become, by their definition, a “true believer”. And it is at this point where we start hearing language like “Big-C-Christians” vs. “Little-c-christians”, or “lukewarm Christians”, and “Being on fire for God!” Ultimately this slippery slope is all about manipulation and the achievement of an all too human agenda. If you can discredit me, then my beliefs and my ideas are no longer valid because I no longer fit a predefined description of a “true believer”. Uh, uh, no way. That’s a slippery slope I’m not going to let us slide down. This type of methodology doesn’t address the question but attempts to make the question moot by discrediting the person asking the question. Let’s go back to the assumption that God doesn’t “move”. I don’t believe this is true. I believe that God searches for us and God finds and meets us wherever we currently are, in whatever state or “place” we find ourselves in. If Jesus is the perfect reflection of the Father, this is exactly how He met and reached people. The Inerrentist functions only with absolutes. Everything becomes terms of black and white – everything must be objective dichotomy. The Innerantist is aware of subjective “truths” and opinions and to avoid their opinions and beliefs to be labeled “subjective” they absolutely need a non-opinionated standard, or “rulebook”. The bible becomes their idol, their “rulebook”. But this rulebook – their bible – must also be an absolute: not subjective. Thus is introduced the “Inerrant-Bible-Theory”. If it is inerrant, it is beyond questioning and therefore completely objective and absolute in its authority. This is the Achilles’ Heel for the Inerrantist who is obligated by definition to defend this Inerrant-Bible, often to ridiculous ends, manifesting itself in a literal interpretation, and most often times resorting to a belief in magic, or circular thinking. The Secular-atheist’s “faith-system” - in relation to the bible - is a negative belief. It necessarily believes in the unreliability of the bible. Which, when thought about, puts as its center exact the same point of the Inerrantist's. This Secular-atheist inherently believes that they have the ability to collapse the whole of Christianity by simply finding one weak link in the Inerrant-Bible’s armor. If they can do this, then they succeed. The Inerrantist and the Secular-atheist share the same center of belief, but represent either side of that coin – the Inerrent-Bible. One believes it must absolutely be defended at all costs, while the other believes it must be (and has been) defeated and discredited. And while this battle runs on the basic message is left unnoticed and its wisdom lost. Both the Innerrantist and the Secular-atheist put the authenticity and authority of the bible in the center of their faiths to some greater or lesser degree. Although they have different issues and different believes, they share that one common denominator: the coin itself. Their belief-systems are only then built upon one of these two assumptions. Both subscribe to an either/or paradigm. I think that is a danger. I'd like to believe there is an both/and paradigm, or even a neither/nor paradigm. To some degree, it can be said that they both have adopted a modern scientific methodology... and like I just said, I think this either/or paradigm is very risky business. The bible is not the center of my faith. The bible, and its inerrancy, is not my Achilles’ Heel. Whether the bible is with or without errors; whether the bible is a literal historical truth, or a metaphoric truth; regardless of what degree of authority the bible does or doesn’t command, has little bearing on my faith and my relationship with God – for it wasn’t through the bible that I came to Him. I’m not here to present an argument to convince you of errors in the bible or the inerrancy of it. I’m here to voice the concern that the Innerrantist should not prohibit others from making that exploration and conclusion for themselves. For every person’s faith you say may be harmed by allowing errors in the bible, an equal amount of people’s faith will be harmed by the insistence of biblical inerrancy, or the subscription to the Inerrant-Bible-Theory. I don’t like answering the question of biblical inerrancy. However, I am also aware of the potential risks of leaving this question open-ended. What if there existed a belief-system, which wasn’t based upon the Inerrant-Bible-Theory? Then you could – hypothetically or potentially – introduce or discover an error in the bible and not have that belief-system shaken or collapse. It doesn’t stand on the foundation of a book (sand), it stands on the foundation of God (rock). So what’s my take on biblical inerrancy? Let me put it this way: based upon my personal experiences and from what I’ve taken and learned from the bible, I’ll say that I don’t believe in coincidences. When you accumulate enough of them, they stop being coincidences and become orchestrations. Whoever that orchestrator is, I believe in Him! Now it is important to make the distinction between Biblical Inerrancy and an “Inerrant-Bible-Theory”. An “Inerrant-Bible-Theory” puts the bible at the center of one’s faith, not God. It makes the bible an idol – in short, it suffers from biblio-idolatry. The gold that the Israelites built the Golden Calf out of was their gold earrings (Exodus 32:2-3). This gold was then melted down and cast into the shape of a calf. After Moses destroyed the idol, he burnt it in the fire, ground it to powder, scattered it on the water, and made the Israelites drink it. It is interesting that Moses didn’t just destroy it. Why would he make them drink it? What’s important is that the material – the gold of the Golden Calf – was always among the Israelites: before, during, and after the Golden Calf. It’s not that the gold wasn’t valuable, it’s just that it wasn’t important enough to worship in God’s place. There’s a lesson to learn here from this story. I see the bible in these same terms as the gold but not the Golden Calf. I am not comfortable saying that I believe in an “Inerrant-Bible” because it runs the risk of making the bible my faith’s center and becoming an idol – making that transition from precious gold to Golden Calf. To go that far is to go too far: just like the Israelites making their precious and valuable gold and reshaping it into a god. But that’s not to downplay its importance and value. The Israelites drank it and absorbed it within themselves. It is worth making part of our beings. It is worth consuming. It just isn’t worth worshiping. The bible is golden but it isn’t a Golden Calf. The validity of the Inerrantist’s whole theological-faith-system is based completely on this “Inerrant-Bible-Theory” – not God, and not Christ. The bible itself – and their interpretation of it – becomes the center and foundation of their faith. Remove this and you remove the legitimacy of their faith. Although I am going to present this an an "academic" conclusion I've arrived at, this isn't really the case. It is true, to a degree, that I have "intellectually" worked my way to this point of making some sort of belief or mental assertion. However, the greater truth lies within my own honesty. In Postdenominationalism I talked about a denominational-paradigm and how it comes to explore, collect and understand the truth. The denominational-paradigm begins the process with the truth and ends the process with the truth. It begins with the assumption that their truth and thesis is synonymous: that their truth is whole and complete. It stands to reason that anything added to this truth can only produce a non-truth, or at best, a watered-down truth. When we add anything to this truth the result can only become a stained version of it's former pures self (as the pure white line turning pink shows). The antithesis added can only yield a synthesis that is not truth. Okay. Alright, I get it. I understand the concept. If we follow it to it's logical conclusions, the more that is added, or "absorbed", can only lead us on a journey farther and farther from the truth. The more we assimilate and incorporate into what was once pure and white, the more unclear and muddy our perceived truth , our synthesis, becomes. With this process, it doesn't get better or clearer, it only ever gets worse. Eventually we will find ourselves at a point when we don't know what the truth is. I can't argue with this logic. It has to be be theoretically accurate. But when I look at Protestantism and it's 23,000 denominations (and this number only goes up if we include Roman Catholicism and the Eastern Orthodox) I begin to wonder. This denominational-paradigm works in theory, but fails miserably in practice. How do we come to terms with this? How do I come to terms with this? (Outside of boldly saying that I'm right and everybody else is wrong)? The denominational-paradigm begins with an assumption; that the whole and complete truth is synonymous with the thesis. As a solution, I had offered a postdenominational-paradigm in which this assumption wasn't made; that the truth (or at least a closer understanding of it) was arrived at only in the synthesis. But the problem is that even this bases itself only an assumption. The only real difference between these two is whether or not we do indeed have in our possession a whole and complete truth. I like what Irshad Manji said in her book "The Trouble with Islam Today". She said that only God fully understands the truth of anything and that only God can punish the non-believer because only God knows what true belief is. I agree. And if only God fully understands the truth in anything then only God's truth is synonymous with the thesis. (And by implication our "truths" are all antitheses). So why the 23,000+ denominations? In a word, Tribalism. We have not overcome our tribal natures. We have, somewhere mixed and half hidden in our mud, the truth. but we are not content with only the truth and contaminate it when we add our subjective versions of our truths and our beliefs either instead of, in condition of, or along side of God's truth. I believe it when Jesus said He Himself was the Truth, but I don't believe it when we simply assume that carries over and applies to us by necessity when we evoke His name. My Confession of Faith is that of , what I'll call, the Three Syntheses. I believe, over the centuries, over the millennia, the truth had been, to some small or large degree, compromised. I still do believe that any addition to a pure, whole and complete truth can only lead to a muddy and unclear (indeed, veiled) perception of what is and isn't. The difference is, I don't believe man ever had it in his possession. I believe that Moses (and by implication, Mosaic Law) was a blend of divinely ordained laws and truths and of man-made laws and "truths". I believe that the Apostle Paul inadvertently gave birth to a Pauline Christianity. I also believe what Paul spoke of in the epistles was a blend of divinely ordained and inspired laws and truths along side with man-made laws and "truths". I also believe that God spoke to the Prophet Muhammad. Like it or not, there is truth and wisdom in the Qu'ran. But on the same note, I also believe it's "pure divine truth" has been made unclear and muddied by man's tribalism. I believe that Moses blended divine truth (thesis) with man-made truth (antithesis) and led to a Mosaic Synthesis and manifested itself as the religion of Judaism. I believe Paul blended divine truth (thesis) with man-made truth (antithesis) and led to a Pauline Synthesis and manifested itself as the religion of Christianity. I believe Muhammad blended divine truth (thesis) with man-made truth (antithesis) and led to a Muhammadan Synthesis and manifested itself as the religion of Islam. I believe in the Three Syntheses. I also believe there are scripture that supports and confirms these things. Although I am tempted to list them, I won't. It is not my intent to prove my truth, or to make my "tribalism" a necessity. After "coming to this conclusion" (in truth I think I've believed this for a very long time, I've just now being honest with myself), I realize there are some implications that I'm going to need to explore and work through. I'm not overly interested in people trying to convince me why I'm wrong, or that my "interpretational methods" - my hermeneutics - is faulty. I need an environment which allows me to work through this. I am not nor never have been "religiously" set in my ways, but it is where I find myself. and I need to accept that and work from there. Anything else is simply me lying to myself. I just fear I won't find any help or even allowance in this endeavour; just assault, criticism, or (worse of all) silence. We need to ask the question, what is it that makes the various denominations within Christianity different? Not specific issues; no, I'm not talking about an in-depth study or analysis into the minutiae. We need to ask, what is it that denominations, collectively, and actively do? I think denominations are about practices: How do we live out or practice our faith? It usually includes traditions (our orthopraxy) or possibly our "habits". I think denominations are also about beliefs and doctrine: How do we understand and what do we actually believe in? (our orthodoxy). So we can say that denominations are about tradition and practice (orthopraxy), and belief and doctrine (orthodoxy). But these must also be a third function: Growth. I feel safe to say that we – as individuals and communities – are meant to learn and grow. This methodology believes that thesis + antithesis = synthesis is in error. We have a thesis (an idea, a theory, a perception of the truth) that the sky is blue. We'll call this my Blue-Sky-Doctrine. In time I come across some one who also has their own thesis, which is contradictory to mine: They believe the sky is paisley. We'll call it their Paisley-Sky-Doctrine. Their idea or perception of the truth, is the antithesis. Two contradictory facts cannot both be right. We sit and discuss the issue and merge the thesis (my Blue-Sky-Doctrine) with your antithesis (Paisley-Sky-Doctrine) and find our “politically correct” synthesis. In short, we agree that the sky is blue and paisley, maybe, possibly, sometimes bluish-paisley (or paisley-ish-blue). If I have a bucket filled with the purest spring water and come along and urinate in it – even if only a little bit – the bucket is contaminated. I wouldn't drink from it even though there is a vast amount more pure spring water than urine. And in addition to that, since it was originally filled with water, some of that got displaced and spilled out to accommodate for the extra urine. This synthesis can only take away from, or water-down, the truth. I had attended an Opus Dei retreat in which the speaker (a Roman Catholic priest) had said “...in matters of doctrine or education, dialogue and discussion of opinions are of no use and fruitless...”. This line perfectly demonstrates the growth method of the denominationalist. If you are part of a denomination, you are subscribing (knowingly or not and to some degree) to that denomination's practices and beliefs. This is the Denominational-paradigm: It says that thesis + antithesis = synthesis is wrong and in error. However this Denominational-paradigm only works if the whole and complete truth is the thesis. The truth and the thesis must begin as synonymous. The Denominational-paradigm begins it's growth from a position of assuming it has the whole and complete truth in its grasp and simply doles it out. It may even be argued that this isn't really growth at all, but only indoctrination. This also plays into potential issues of authority. However, the very existence of numerous denominations – of the division of denominations themselves – makes this starting point – this assumption – difficult to substantiate and hold. However, it must be acknowledged that there is another method, or paradigm of learning and growth. The Post-denominational-paradigm sees, searches, collects, and claims truth differently. We have a thesis (an idea, a theory, a perception of the truth) that the sky is blue. We'll call this my Blue-Sky-Doctrine. In time I come across some one who also has their own thesis, which is contradictory to mine: They believe the sky is black. We'll call it their Black-Sky-Doctrine. Their idea or perception of the truth, is the antithesis. Two contradictory facts cannot both be right. We sit and discuss the issue and merge the thesis (my Blue-Sky-Doctrine) with your antithesis (Black-Sky-Doctrine) and come to a synthesis. What we have discovered is that sometimes the sky is blue and sometimes the sky is black. Ultimately we have discovered a larger truth: Day and Night. Postdenominationalism is akin to wringing the truth out of a thousand lies. I subscribe to a Post-denominational-paradigm of growth and learning. But since we currently live in a denominational-Christianity, this puts me into somewhat of a conundrum. Denominations manifest themselves in the real world as churches. So I either belong to all churches, or I belong to none. And since the church itself also has a say in this matter... it become complicated and difficult. I think there exists the potential of moving into a Postdenominational-Christianity, but we're not there yet. The traditional church (the Institutional church based upon the economic Business Model) as we know and understand it today (and all religion for that matter) is in crisis. I believe it is dying and the question is what are we going to be about it? Denial: “If it's not broken, don't fix it” is their motto. “There's nothing wrong with Christianity, it's the rest of the world.” This is Fundamentalism and will eventually lead to isolationism. When the shrinking world no longer allows them to exist in isolation, the reaction will be extreme. This extremism will manifest itself as either terrorism, or extinction. Aggressiveness: This is the “take it out behind the shed and shoot it” extreme. The problem with this is twofold. It offers noting in it's place and it addresses the symptoms but not the disease. A symptom is the Institutional Church (or Christianity) as we know it, but the disease is religiosity. We move into a Postdenominational age. As the world becomes increasingly smaller and various beliefs, denominations, cultures, and “tribes” are no longer allowed to exist in isolation – are forced into contact or collision – it should become obvious that to wholeheartedly believe that the truth we hold in our possession is the absolute, whole, and complete truth, is not only arrogant, but also ignorant. I believe we are witnessing the slow and painful death of the Denominational-paradigm. I believe we are also witnessing the labour-pains of Postdenominationalism. But what would or does this look like? Are there any examples of this? Are there any examples of this Centrist Christianity? Are there any examples of a Churchless Christianity? Can we truly have a “doctrineless” Christianity while not be Non-denominational or Unitarian-Universalists? "Non-denominational" can itself be a denomination. TheOoze (only for an example) is definitely a community rather than just some discussion board. I would even say TheOoze is a church in a certain way. There is no predominant denomination present (or dominant theological perspective) here, which was so ingeniously proven in one thread. But at the same time couldn't TheOoze be called "Non-denominational"? Multi-denominational, maybe, but Non-denominational.? No, I don't think so. I mean some people there belong to their own denominations, but it's something even beyond that. TheOoze isn't just a side dish of a main course. It has a life of it's own: we all bring something to the table. And this is interesting and worth exploring. Unitarian-Universalists (UUA) is a denomination onto itself. Basically - as far as my limited knowledge here goes - a UUA church hold no official doctrines. In a way I can see why some would attempt to label TheOoze as being UUA: There are no officially held doctrines at TheOoze. When encountering a creature never before seen and desperately attempting to categorize it, to make it "fit", into the only way they know of: the UUA becomes a close fit. But TheOoze is not UUA and neither is it "Non-denominational". I think this is where some get confused or sidetracked - seeing the "Universal Church" in the Catholic sense of the word. Embracing the ecumenical richness of the various denominations was seen as a bad thing and corruption - in fact, any sort of ecumenical "cross-over" or seemed to be the devil's work. TheOoze is definitely embracing the concept of the "Invisible Universal Church". We all, as Christians, are members of, and bound by, this "Invisible Universal Church". But isn't that the very core that holds Christianity together? Those invisible bonds of the Holy Spirit - like the wind - unpredicitable and uncontrollible by men? I think it is man's attempt to reign it and control these bonds that give rise to denominations and divisions. After all, they're man-made - they are byproducts of our fallen state and we've embraced them. That's why so many people feel "free" at TheOoze: Those "shackles" have been removed. I still believe we are and must move out of this disassemble/reassemble cycle and into a Postdenominational Christianity - another word, I suppose, would be Unity. I think TheOoze may be a step in this direction. I think that's why so many people have a difficult time labeling it, or putting their finger on it... we've never seen this before.